The benefits of becoming a digital office are well-documented, and businesses have much to gain from adopting technology that streamlines employees’ workflows and routine processes, while maintaining high levels of security and compliance. The modern workplace is experiencing dramatic gains in productivity and efficiency, while also improving the way teams and clients collaborate from anywhere, at any time, on any device. Industry analyst firm IDC indicates that 80 percent of businesses have processes that still rely on paper and that most organizations are just beginning to transform their businesses with document and information management leading the way. Yet, 72 percent of businesses agree that improving document processes would increase customer satisfaction and/or increase brand value. 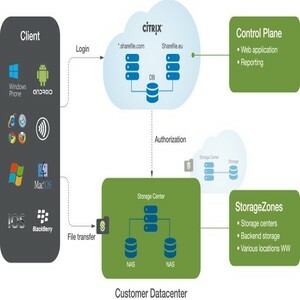 With these market drivers and the influence of the more than 80,000 business customers and 20 million business users, Citrix continues to drive innovation in its leading file sync-and-sharing solution. These include a smarter and simpler user experience, as well as a more streamlined way to view and take concise action on files of all types, including getting feedback and approvals on documents, sharing DICOM medical images, viewing 3D architectural renderings, and even requesting and tracking audit lists. ShareFile customers are more productive, collaborative, and secure, as they transition to the workplace of the future by evolvingtheir business workflows and processes from paper to digital. In today’s business environment, there is an explosion of data and apps, and an ever-growing need for collaboration across geographies. However, there has been no systematic way to store, share, review or approve documents that are critical to business functions and services until ShareFile. ShareFile is built – from the ground up – for business, giving customers a simpler way to collaborate with teams and clients with built-in feedback and approval workflows. Users can get feedback, request approvals and e-signatures – all within ShareFile’s web interface. Track feedback and approvals in real time with the ability to set due dates and view status at any time. Eliminate the need to send documents via email and track for version control. ShareFile gives customers a smarter way to work with a new, web-based dashboard and interface. Recentlyopened files are easily accessible. Users can do more in less time with easy-to-find actions and a clean, straightforward design that enhances productivity. Quick access to tutorials and links are available upon log-in to guide users step-by-step. ShareFile provides a better, more convenient way to view every file with its new content viewer. Users see a clear view of 60+ file types without the need to wait for downloads and have the ability to preview the most common file formats, including PDFs, without having to leave the web browser. Users can conveniently share files, and request feedback and approvals through workflows – right from the viewer. Many industries, including finance, insurance, and real estate, have specific workflow and compliance needs – including support for FINRA, HIPAA and CFPB. ShareFile addresses these needs, andcan be configured in a way that streamlines many of the common, industry-specific use cases – particularly in Accounting and Healthcare. The high level of customization and industry knowledge that ShareFile providesenables customers to have workflows and peace of mind that is tailored to their individual needs. ShareFilefor medical imaging enables customers in healthcare-related fields to reduce their need for CDs with its diagnostic-quality DICOM viewer and storage that supports HIPAA compliance. Healthcare providers and payers can now request, upload, viewand share medical images in a simple, cloud-based environment.For nearly a decade, CPAs using ShareFile for Accounting have been able to easily exchange large QuickBooks files, monthly statements, and tax returns. Thanks to the most-recent improvements to ShareFile, CPAs can now create and track PBC lists (Provided By Client Lists), and request e-signatures for IRS forms 8879s. The request list feature eliminates the painstaking need to rely on email and spreadsheets, reducing complexity and error. Samantha Rice, Firm Administrator, McMahan, Thomson & Associates, P.C.